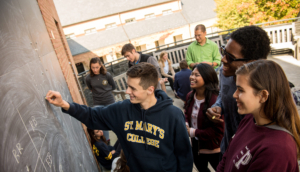 St. Mary’s College students go all in. And student life is no exception. Our slice of the college experience is a swirl like no other: skateboards, athletics (Go Seahawks! ), bikes and bikes and bikes, bonfires at the Point, 100+ student clubs, a climbing wall, fly fishing classes, bare feet, award-winning theater. And we can’t forget Bottom County, our outdoor student run music festival. Get involved with one (or fourteen!) of our 100 student clubs. Have a laugh with a speaker at our nationally recognized Twain Lecture Series. Hit up the Main Stage for a performance like no other. On any given day you’ll find the campus buzzing with student groups and activities. If you’re vegan or vegetarian, we’ve got you. And if you’re paleo, gluten free, raw, or a chicken nugget eater at every meal, we’ve got you, too. From organic produce grown by students at the campus farm to locally produced seafood, free-range poultry, and naturally raised beef, there’s something delicious for everyone. Our food is truly tasty. And environmentally on point. Our campus dining is managed through Bon Appetit, called The Most Innovative Company in Food by Fast Company. They also serve food to students at MIT, University of Pennsylvania, and 14 of the Daily Meal’s 75 Best Colleges for Food. Each residence hall, suite, apartment, and townhouse has its own personality and amenities. Queen Anne Hall houses the Vegetarian/Vegan Food Co-op. Crescent Townhouses encircle the Seahawks stadium (so you can catch every game from your front lawn). The Greens Townhouses have water views of the St. Mary’s River. Cap it off with specialty options like Women in Science, substance-free, and open housing, and you’ll be faced with so many choices that you might just wish for a sorting hat. Being on a gorgeous waterfront campus has its perks (anytime-access to stand up paddle boards? Yes, please.). But when you’re not in the mood to hit the beach, we have plenty of other options, like the Cole Cinema, which screens current movies (for free) every weekend. Or karaoke in the Campus Pub. Or head to The Pillow, kick back and just watch the clouds. Life is definitely good. College is supposed to challenge you (that’s the point!). But we’re not going to leave you out there on your own. We are here, and we help–in any and every way. We have an extensive academic support network for students who need a lot–or a little–help. Our faculty advisors help you choose courses that meet your passions. Our Writing and Speaking Center helps you fine tune your skills during the semester. And our workshops on time management and motivation can help kick you into gear during finals. Our Career Center is committed to getting you on the path to professional success. From launching you on your four-year career plan to connecting you directly with internships and jobs, the Career Center provides you with what you need to pursue the career you want. Our registered nurses and mental health professionals are on campus Monday-Friday, providing a plethora of services including routine and emergency care, laboratory tests, and a variety of individual and group counseling.